This is part of an ongoing series highlighting faculty in the Undergraduate College at Wake Forest. When Elizabeth Clendinning started traveling to Bangah a few years ago, she couldn’t find the Indonesian village on Google Maps. Clendinning has made her way around Bali on a motorcycle, attending concerts, playing with local musicians, and hoping to avoid the monkeys that cause trouble on the Indonesian island. Like other people who have developed a passion for gamelan, Clendinning has gone to great lengths to study the traditional Indonesian music that involves the playing of gongs, drums, and other percussion instruments by an ensemble. The Assistant Professor of Music even joked that sometimes she’ll talk to colleagues who work in Bali and worry that they’re more into gamelan than she is and that they loved the music from the first time they heard it. Clendinning has researched music from everywhere from Bali to the Buffy the Vampire Slayer TV series. 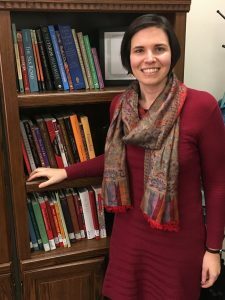 She has used her work in ethnomusicology (the study of music from different, non-Western cultures) to discuss broader topics involving anthropology, religion, and gender studies at Wake Forest University. “I have absolutely loved my two courses with Dr. Clendinning,” said Nick Jundanian, a junior who’s majoring in Business and Enterprise Management. “She always brought such an amazing energy to class that really showed how much she cared about the subject and how much she cared about her students. Concert footage of Clendinning leading a gamelan ensemble while playing a traditional Indonesian drum known as a kendang can be found on YouTube.com. Meanwhile, all the cabinets in her office in the Scales Fine Arts Center are filled with her colorful Balinese dance costumes. Clendinning said she couldn’t “escape” music while being raised in a musical family. Her father sang in choruses, and her mother is a longtime Professor of Music Theory at Florida State. While Clendinning was exposed to gamelan on FSU’s campus when she was 12, the music didn’t leave an impression on her. She heard it again while in college, but she didn’t get into playing it. Finally, in 2010, a Balinese dancer moved with her husband to Tallahassee so he could work on his Ph.D. in Education at FSU. When the dancer started teaching, Clendinning attended the classes and became enthralled with the music, dancing, and culture she was exposed to from Indonesia. 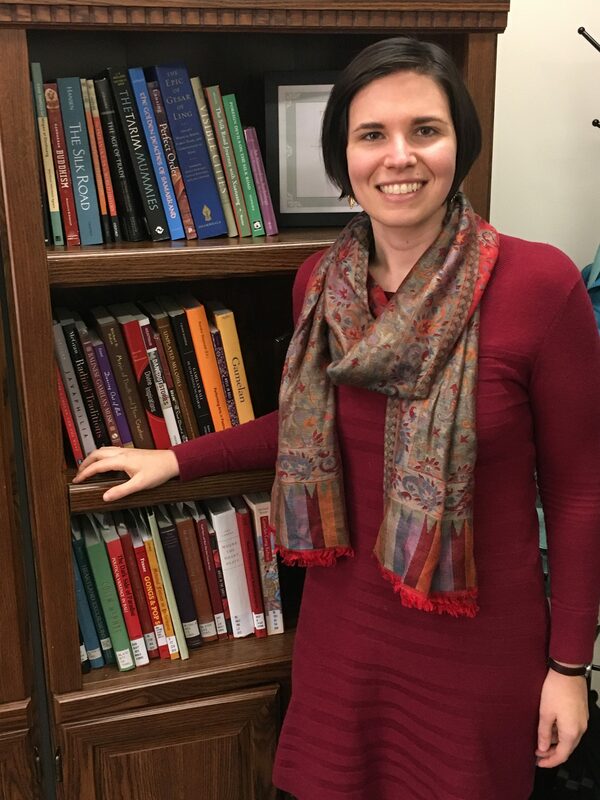 Clendinning has traveled to Indonesia four times since 2010, often to do research for an upcoming book on ethnomusicology and the ways that teaching world music to non-native students has shaped lives and created transnational communities. Clendinning has stayed closer to home to write about her other academic interest – the music that’s used in films and on TV shows. She sees a connection between the music in the two Tron films and gamelan; they’re both attempting to represent other people, other cultures, and other times and places.